I was browsing the Barry M stand in Superdrug the other week when I stumbled upon something interesting. I'm afraid I am pretty much over the crackle trend of last year - let's face it, it's been done to death - but now Barry M has brought out something much more intriguing: croc-effect nail polish. 1. Apply a thin coat of your chosen nail varnish. 2. Wait 1 to 2 minutes until nails are touch dry. Do not apply to dry polish. Probably the main differences between this polish and crackle is that instead of applying to dry nails, you apply it when your nails are still tacky. (In case you're wondering what happens when you apply it to dry polish, the answer is nothing. Absolutely nothing happens. You've basically just painted your nails black. Congratulations.) Also unlike crackle, the effect doesn't begin to show instantly - it does take a good couple of minutes for the design to materialise completely. I decided to try the croc effect over OPI Chocolate Moose, a pink-toned brown creme. I found the croc effects polish was thicker than normal crackle ones, but it didn't cause any problems. It also dries much shinier than your standard crackle, but I'd recommend a top coat regardless to make it last longer. The size of the pattern varies depending on how thick/thin a coat you apply; the thicker the coat, the larger the pattern. Overall, I really like this nail polish. 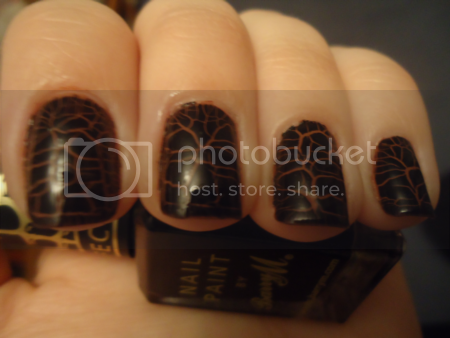 It's a bit different to the tired crackle trend, and I personally think it looks classier. I got a lot of compliments when I wore it out. It cost me £3.99, which I think is very reasonable, and while it's only available in black at the moment I imagine Barry M will bring it out in more colours if it's popular. I can't say it exactly looks like crococile skin, though - it reminds me more of cobbles or a limestone pavement (can you tell my A-Level in Geography is kicking in?!). Still, if you want to try animal skin nails but don't feel your nail art skills are up to leopard or zebra print, this is an easy alternative.